Convergence of Ritz values [Ref1]. See numerical results. Convergence of vector S-fractions [Ref1] (with V. Kaliaguine, Nizhny Novgorod, and M. Castro Smirnova, Sevilla). Approximation of the Weyl function of non symmetric difference operators, with applications to nonlinear discrete dynamical systems and the convergence of J-fractions [Ref1, Ref2] (partly with V. Kaliaguine, Nizhny Novgorod). ``Fraction--free'' algorithms for computing GCD's and normal forms of polynomial matrices (with G. Labahn, Waterloo [Ref1, Ref2], and G. Villard, Grenoble [Ref3]). Reliable methods for scalar rational interpolation [Ref1, Ref2, Ref3] (with C. Carstensen, Kiel). Interpolation with polynomial linear combinations of functions [Ref1, Ref2, Ref3], with applications in approximation, extrapolation, and quadrature methods. Matrix-valued rational interpolation problems [Ref1, Ref2, Ref3, Ref4] (with G. Labahn). 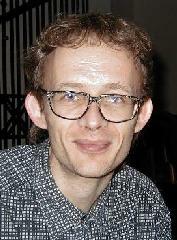 "Rational Approximation of analytic functions and its applications to the spectral theory of difference operators, non-linear dynamical systems, special functions, and number theory" , Research project INTAS-2000-272 of the European Union (Leuven, Moscou, Nishnii Novgorod, Madrid, Granada, Berlin, Coimbra, Lille), since 2001. Bilateral cooperation "Formation par recherche" Russia - France (Rouen, Toulon, Lille, Moscow, Nishnii Novgorod), 1997-2000. Trilateral university network Russia - Germany - France (Rouen, Lille, Lübeck, Hannover, Moscow, Nishnii Novgorod), since 2001. Bilateral cooperation "Méthodes itératives en Calcul Scientifique", Leuven, Lille (applied). Research project "Special functions and approximation theory", Almeria, Leuven, Lille (applied). SIAG OP-SF Euro Summer School 2002 on Orthogonal Polynomials, Harmonic Analysis, Approximation and Applications. Leuven, (Belgium) , July 15-21, 2002. CG50 - GG70: a conference commemorating 50 years of Conjugate Gradients and celebrating Gene Golub's 70th birthday, ETH Zurich, Switzerland, 18 - 20 February 2002. Numerical Algorithms, Marakesh, Maroc, October 1-5, 2001 (in honor of Claude Brezinski). Summer school on orthogonal polynomials, harmonic analysis, approximation and applications, Inzell, Germany, September 17-21, 2001. Analytic Theory of Continued Fractions, Orthogonal Functions and Related Topics, Grand Junction, Colorado, August 6-10, 2001 (in honor of Bill Jones). Computational Methods and Function Theory, Aveiro, Portugal, June 25-29, 2001. 6th International Symposium on Orthogonal Polynomials, Special Functions and their Applications, Roma, June 18-22, 2001. 6th conference on Approximation and Optimization, Guatemala City, Guatemala, March 25-30, 2001. SIAM/ILAS Conference on Applied Linear Algebra, Raleigh, North Carolina, October 2000. Matrix iterative analysis and biorthogonality, Luminy, October 2-6, 2000. Summer school on Approximation, Complex Analysis, and Potential Theory, Montreal, Canada, July 3-14, 2000. ICCAM-2000 , Leuven, July 17-21, 2000. Abstract. Orthogonal Polynomials: approximation and harmonic analysis, workshop in Inzell, Germany, April 14-18, 2000. Abstract. Journee Approximation, Lille, March 16, 2000. Minimal energy problems, Hong Kong, November 1999. Abstract. ICRA 99 Home Page, Rational Approximation, Antwerpen, June 1999. Workshop Orthogonale Polynome in Ballenstedt (Germany), 23.-26.4.1999. Pictures. Exposé dans le cadre des Trois demi-journées de conférences sur le thème Algèbre Linéraire Appliqué, Laboratoire Analyse Appliquée-Optimisation, Université de Bourgogne, 1-2 Avril 1999.